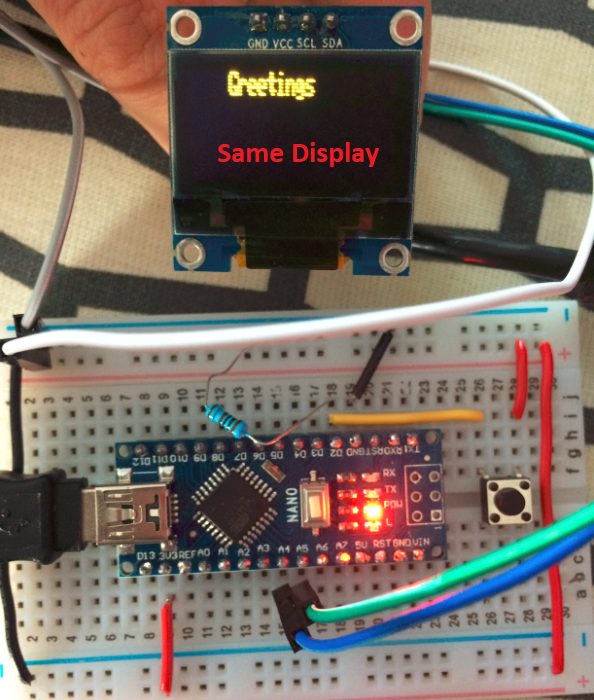 I've been trying to to force my ESP8266 to work with different l2C displays for the last 5 hours, but I was unsuccessful and need someone's help. I have also tried this setup as described in this post, but the results were even worse. I could not get the device detected at all. 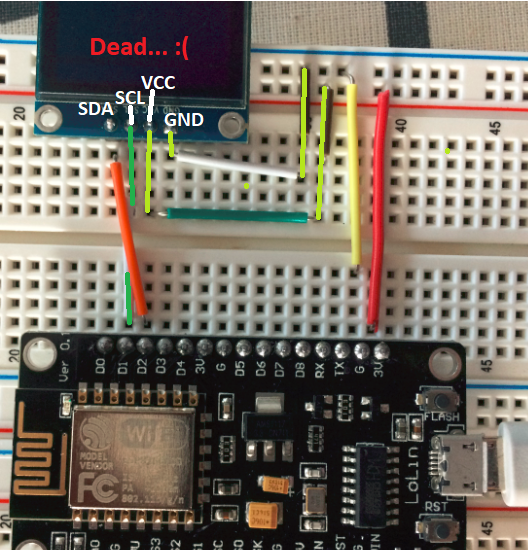 Obviously, when I connect i2C display to Nano I use different pins. 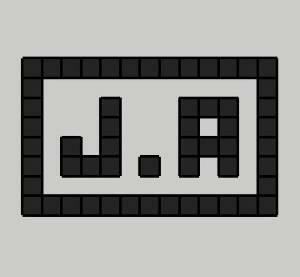 NodeMcu Lua ESP8266. Only finds the display the first time after I press Reset button on the controller. "You need to power the board with external power supply. I used 5V/GND from Arduino powered by 12V/1A adapter on VIN/G on NodeMCU bottom left (USB facing down) - because that is what I had readily available on my desk when testing a batch of samples. Some units may work without external power, other may not even come up as serial port, some may cycle between serial port apearing and disapearing. 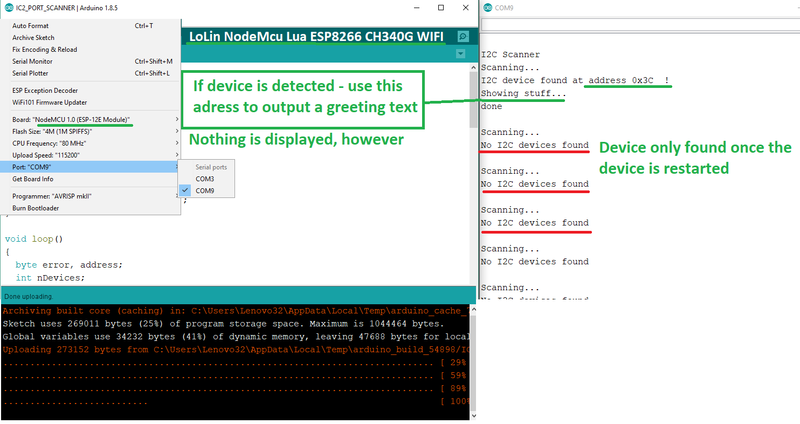 NodeMCU does not have large power draw, but power surges from it's own working are most likely reseting the device. Some poeple have had success installing additional electrolytic capacitor on the device." So I went ahead and did as this message suggested. 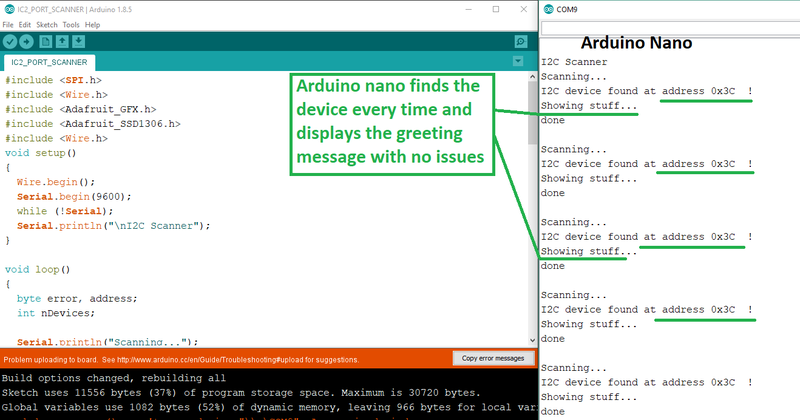 I've connected my Arduino Uno to 12V DC source and used it's 5V output to power NodeMCU via Vin. The result is - no luck. I don't see any difference. The display still does not show anything. I power the NodeMcu Lua ESP8266 controller using my USB 3.0 from the laptop. Does it mean it's a problem? Do you suggest something? I've just managed to make it work. Adafruit_SSD1306 display(-1); // -1 means there is no "Reset pin" I have no idea what it really means, but as long as it works - I'm more than happy. 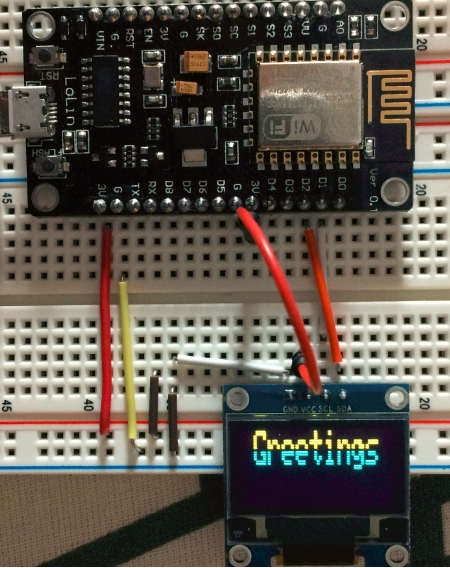 The I2C conection between a LoLin nodeMCU and a chinese 0.96" oled screen is only posible, in the Adafruit examples, if everybody do the change in the line before you have showed to us.